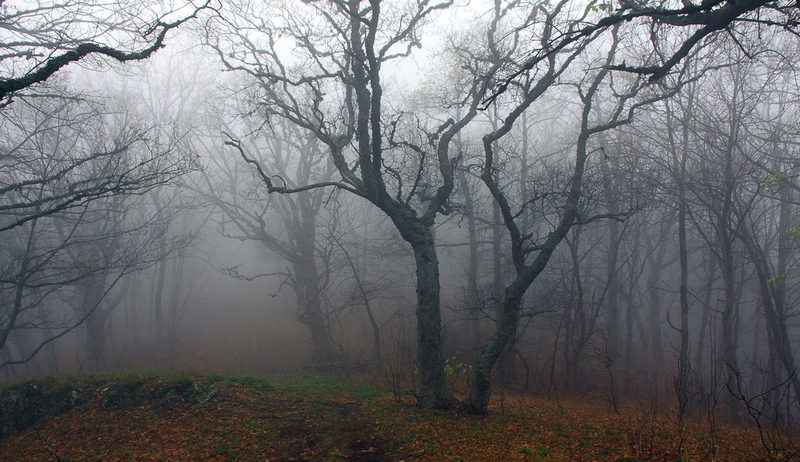 Francis Asbury’s ministry to the Colonies is one of America’s greatest untold stories. His ministerial and cultural efforts to reconcile European, African, and the Native American populace are peerless. 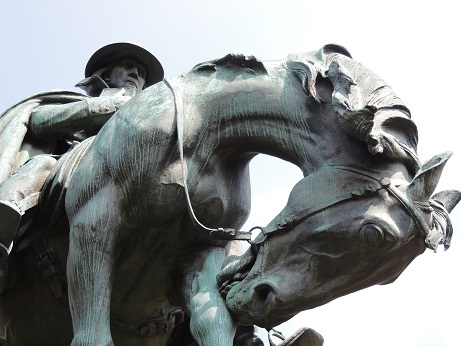 More than a century later, President Calvin Coolidge dedicates a Washington D.C. equestrian monument to the young pastor from England. He calls Asbury the “prophet of the wilderness” who is “entitled to rank as one of the builders of our nation.” On a different occasion, Asbury receives recognition by the National Historical Publication Commission (NHP) of the United States as one of the sixty-six American citizens “whose works are essential for the understanding of the development of the American nation and its strategic place in world history.” Both houses of Congress agree to publish his writings. According to the Wesley Center Online, (http://wesley.nnu.edu/other-theologians/francis-asbury/the-journal-and-letters-of-francis-asbury-volume-i/francis-asbury-the-journal-vol-1-introduction/ ), recommending them for “proper editing and publication, along with Washington, Jefferson, Adams, Lincoln, and the other immortals of the land.” This proclamation, coupled with the fact that Asbury arrived to America and practically remained “in the saddle” for 45 years without owning a home in effect makes Asbury America’s British Founding Father. The recommendation of the congress launches the three volume Journal and Letters published in 1958. 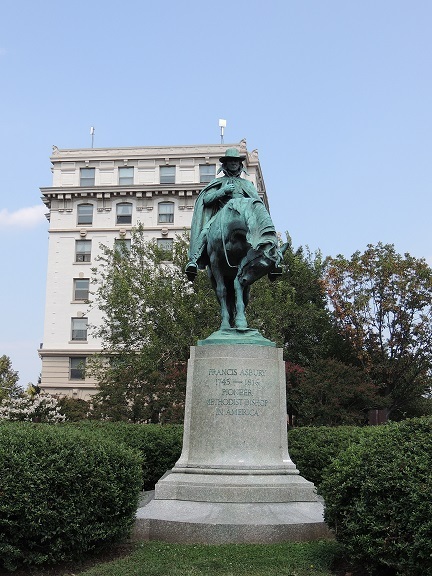 Three decades before the NHP Commission acknowledgement, Congress gives approval to the Francis Asbury Memorial Foundation to erect a granite and bronze equestrian statue of the traveling preacher. 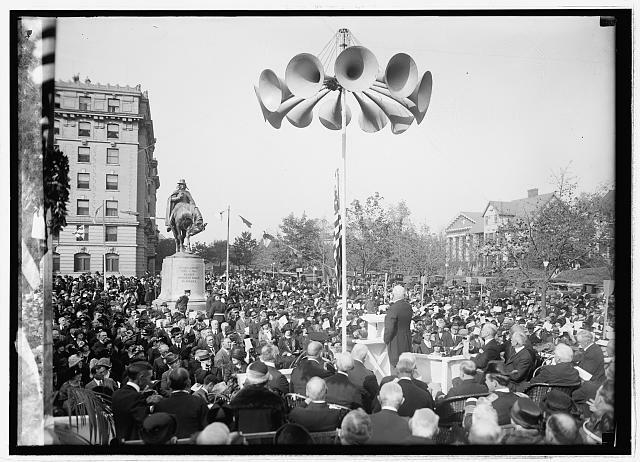 Five years after the February 29, 1919 congressional approval, President Calvin Coolidge dedicates the statue. Included is a picture from the October 15, 1924 event. Immediately the picture draws you to the immense crowd that gathered that autumn day at 16th and Mount Pleasant Street in Washington D.C. In addition, the speaker at the podium is none other than President Calvin Coolidge. Truly, a great day, one wishes they could have been there. As a musician, I strangely gravitate toward the pole in the center of the photo. Clearly the most up to date technology of the day. Those crazy 20th century sound men.